Set in Jiangmen, this family-friendly hotel is 15.2 mi (24.4 km) from Xiqiao Mountain National Forest Park. Located in Kaiping, this hotel is 6.5 mi (10.5 km) from Kaiping People's Park and within 25 mi (40 km) of Taishan Museum and Mt. Shihua Park. 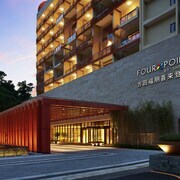 Located in Pengjiang, this boutique hotel is within 1 mi (2 km) of Jiangmen Stadium and East Lake Square. Donghu Park is 1.4 mi (2.3 km) away. 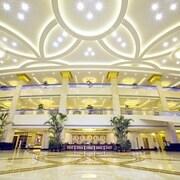 Situated in Jiangmen, this hotel is 21.1 mi (33.9 km) from Xiqiao Mountain National Forest Park. 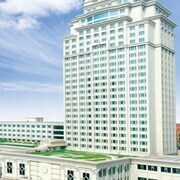 Located in Pengjiang, this hotel is within a 10-minute walk of East Lake Square and Jiangmen Stadium. Donghu Park is 0.6 mi (1 km) away. 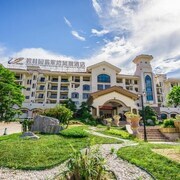 Situated in Jiangmen, this hotel is 18 mi (28.9 km) from Xiqiao Mountain National Forest Park and 21 mi (33.9 km) from Guan Yin. There are no hotels in Jiangmen, so a good alternative is to make a reservation at one of the 16 accommodation options that are less than 30 kilometres away. 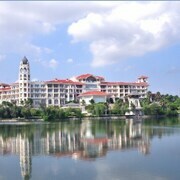 The Xinhui Country Garden Phoenix Hotel, Jiangmen, which is the nearest hotel, is 25 kilometres from downtown Jiangmen. 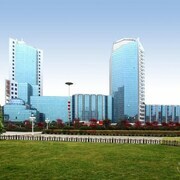 As an alternative, try the ibis Jiangmen Xiqu, located in Jiangmen, which is 35 kilometres away. 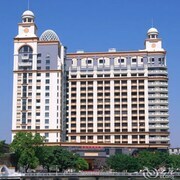 The Overseas Capital Hotel is situated 35 kilometres from the heart of Jiangmen. Or, alternatively, the Phoenix Hotel Wuyi is positioned 35 kilometres away. You could also check out the rates and amenities at the Yucca Hotel or the Taishan Country Garden Phoenix Hotel. After you've had fun in Jiangmen, ensure you have enough time to explore Guangdong's other attractions. Visit the fortresses and temples in Guangdong, and enjoy the area's lovely rural landscapes and rivers. Or join the locals rock climbing and mountain climbing while you are here. It is well known that we Aussies just love to have a good time, so consider staying a little longer and check out the National Dr. Sun Yat Sen Memorial Hall and The Western Han Museum of the Nanyue King Mausoleum, which you'll find in Guangzhou, 95 kilometres to the northeast of Jiangmen. Should you wish to spend a few nights in Guangzhou, check out the room rates at the The Garden Hotel Guangzhou and Crowne Plaza Guangzhou City Centre. 70 kilometres to the north of Jiangmen you may also choose to stay at Foshan, home to the Swissotel Foshan and Crowne Plaza Foshan. If you stay in Foshan, set aside some time to visit the Zu Miao and Renshou Temple. Before your Jiangmen trip comes to an end, why not spend an hour or two rubbing shoulders with Guangdong sports obsessives at a local game? Tianhe Stadium is 95 kilometres to the northeast of Jiangmen. For travellers who are interested in booking a bed close by, make a reservation at the W Guangzhou or the Four Seasons Guangzhou. 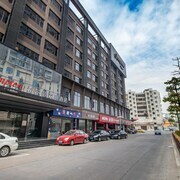 Visitors arriving or departing through Zhuhai Airport may choose to stay at the Zhuhai Sunshine Airport Hotel or the Hongyin Hotel - Zhuhai, both of which are a short ride away.